Last year's Light The World Children's Service Calendar that I made took on a life of its own! It was so amazing for me to see my work and inspiration loved by so many families all over the world. I got emails from General Authorites saying they had given one to each of their many grandchildren, I got pictures from all across the globe, and I got many thanks from the sweetest readers ever (that's YOU!). There was absolutely NO DOUBT that I would be recreating this activity for 2017! The Light the World campaign for 2017 is very similar to the 2016 version. Instead of simple phrases for each day, this year has scriptures that guide us to light the world with the light of Jesus Christ! Christ, himself, taught with repetition and these calendars do the same. Your kids will love doing their own acts of service each day! Feel free to print as many of these as you want for friends, families, and Primary. READ THIS BEFORE YOU DOWNLOAD: My heart has truly been broken this year as I have seen sisters from the church copying my calendar and offering it in Facebooks Groups as their own download. This is stealing. Period. YOU CANNOT make this black and white, shrink it to one page, change its formatting, change the colors, drag and drop it onto your own background, or offer it as a download in any way, shape, or form. I would love it if you would share the link to this blog post with your friends and neighbors. Please start off the Light The World campaign with an honest heart. 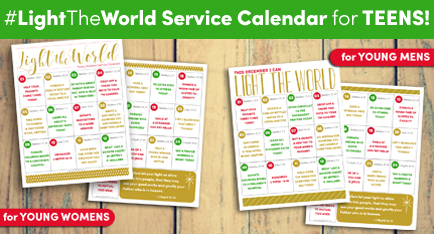 CLICK HERE for this year's Light The World Service Calendar for TEENS! Love this,and the added bonus of my favorite primary song on it as well really makes my heart explode!! Thanks so much for sharing Emilie! Thank you so much for making this up again! I just reposted it on my Instagram for others to benefit from your great work! this is so great! I was wondering if there was a way to add the scripture reference to each day? I wanted to hand this out to my junior and senior primary and wanted to encourage them to read the actual scripture. Also, I was wondering if there was a way to format it so we could do 4 on a page?? This is wonderful. We had so much fun doing it last year! Do you have the daily scriptures listed somewhere I can reference? Hi! I would love to give these to my primary kids on Sunday, but I can not download it on my macbook. It keeps opening up a blank tab. Is this compatible with Macs? Thanks for your help! I love this calendar! Thank you for sharing your talents! I would like to use this calendar as a handout at a non-denominational creche that our stake sponsors. Is is it possible to edit the 25th to a good example for children of all faiths? Thank you! This will be the 2nd year we use these for our primary kids. Thanks so much! Thank you so much for this! My daughter is happy to start her own light the world campaign with your ideas! Thank you so very much for sharing your talents! This calendar is perfect for our Primary! Thank you sooo much for creating this for free!! We used your calendar last year and I was crossing my fingers you'd have another one for this year! Thanks so much for sharing!! I am so excited to find this calendar! It is perfect. Thank you! Thank you Emilie!! Love it! I must be missing something simple trying to get it download. I reach the box.com site, log in, hit the download button and nothing happens. i'm using an iMac computer, if that matters. Thanks. My kids are quite excited to do this this year. We weren't able to download it either. It changed our chrome homepage and isn't allowing it to be downloaded. It has been quite frustrating. We keep getting ads for downloading other programs on your site. :( We would love to get some help with the download of the service calendars. agreed. Does not work on macs with chrome. I also couldn't get this to download, I'm so bummed because its so beautiful!! Please share again if you can get it to work! I can't get it to download either. Any tips? READ #21 - This worked for me. I too had the Mac issue. #21 Thank you because it worked for me too!! THANK YOU SO MUCH!! This is exactly what I needed. Thank you thank you! Thank you!! This is amazing! Will share the link so others can know about this gift also! Now the security on the PDF document has been removed and we can download it. Thanks for making that change. Thank you for sharing! We used this last year and I'm so happy you made a new one! So nice to have the simplified version for my kiddos! Thank you for sharing. This is awesome and YOU are wonderful!!!! Thank you for sharing this. My little guy is autistic and I can't get him to go to church so anything that helps him feel the spirit, especially around Christmas, is greatly appreciated. Thank you for providing this calendar. It's a really great thing and I look forward to having my primary-age kids use it. However, I'm not sure I understand why you are so concerned about people modifying it to make use of it for their own purposes? Will people's modifications and adaptations somehow diminish what you have created? I believe making your calendar truly open (see creativecommons.org) and allowing - even encouraging - people to adapt your work (including translating it) will actually increase the reach and good impact that it can have throughout the world. If you use a Creative Commons-Attribution license, then people will know that they must attribute you and point back to the original calendar (and your blog). This would allow people to do what they obviously want (or may need to do, in the case of translation) while maintaining integrity, increasing the reach of your calendar, and providing you with proper and well-deserved attribution for your work. If you are interested in considering this option (and thus being able to remove the very off-putting notice that you now attach to the calendar), I'd be happy to give you some advice. Freely ye have received, freely give. I make sure that everything I make available on this blog is offered completely free of charge. Because “ freely you have received, freely give”. HOWEVER, I put hours and hours into creating this calendar and the young men young women’s calendar for people and it is my intellectual property. When other people take the work, alter it, and offer it as a free download on other areas of the Internet, not only is it stealing my work, but it also takes money out of my pocket. I work with the LDS church and sell them as space on my blog that accrues payments based on how many people visit the blog. I use that income as a very necessary part of our family’s budget in order to help pay off medical bills we had from a hospitalization my young daughter experienced in 2016 that we are still trying to pay off and which has been financially crippling for my family. Regardless of whether people have ads on their sites or not, taking somebody else’s work and altering it in any way and then offering it to anyone else is dishonest. Period. Thank you so much for this! And as a former blogger, I so understand the frustration of having work stolen and passed off as someone else’s. People don’t seem to understand that the free content they enjoy is made possible by the traffic to the site. Thank you so much! I love it! So sorry people are not being honest! Thats really sad because what this represent, how can you be dishonest?! It baffles me. Merry Christmas! Thanks again! Thank you for doing this! I really appreciate all of your hard work that you freely share with us. My kids are lucky I found you! THANK YOU!!!!! You = #Light the World!!! Totally love this. I have been asked by members and non members where I found it and have been sharing your link. This is great. Thank you. My son is enjoying the experience of each of the days. Thank you for the calendar! I'm sorry you have had people stealing it. I appreciate your talent and want you to know that I tell people how amazingly talented so many women are and how they freely give so much like this calendar. I printed it and used it for the young woman with kids that I visit teach and made little tea lights to go with it for them to light with each day. Thanks for sharing with me. Have a merry, merry, merry December. Thank you so much!!! It breaks my heart that people are being dishonest. I have been pinning, sharing, and telling people about your work. Thank you for sharing your talent with us!!! I do have to apologize though! I just came back to your page to leave a little thank you and saw your note about people sharing your calendars unlawfully. I am one of them without even realizing it. I am so sorry! I printed a copy of your calendar (in black and white, on one page) and shared it with our primary children. I did note that it was taken from your site and provided the url and was sure to not take any credit for it, but I did not realize this was still not okay. I will be sure to simply share your url and invite them to download it themselves in the future. As a side note, I have shared your url on facebook and in my BYU-Pathway class as well. I hope you are able to receive the blessings for sharing this wonderful tool with so many of us! Thank you again!! I'm prepping for sharing time tomorrow and just found this AWESOME calendar! I'm totally stoked to give it to my primary kids so they can participate in the "Light the World" campaign. I especially love the independence it gives children so that they can do something for LTW whether on their own or with their families. Thank you SO much for creating something great for kids! And I couldn't get it to work with my Mac Safari either. So, I used the suggestion made in comment #21 and emailed the PDF to myself. I then was able to print it out. Thank you as well to Adele who figured this out! Thank you for sharing your hard work. 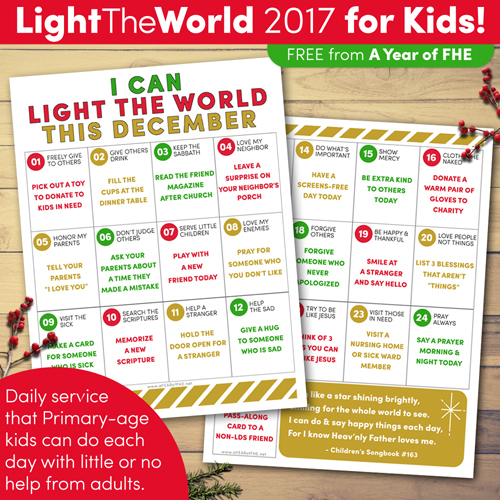 I am excited to use the kids version of light the world with my young children. Thank you for having a giving heart! Thank you, thank you for the time you put in to create this for kids. I am so excited to use it in our family throughout December. I love the kid version! Thank you so much for your sharing your time, talents, and energy! This is amazing and you are blessing so many lives by sharing this work! Thank you! Thank you! Thank you! Have a wonderful holiday! Thank you so much for sharing your talent with us. I will be using it for a big group of Activity Day girls as well as my own children. I can picture how doing these ideas will brighten the world for other people, as well as the children who are doing these acts of kindness. You are part of helping others do that. Thank you again! Thank you so much for this! I have been racking my brain over how to make Light the World more applicable to my 5yo, you did it for me! Bless you!! Thank you so much for this wonderful resource! We will definitely be using this for our young kids! Ages 7, 6, 4, and 2. Thanks! Thank you for this! I'm so sad to hear people have been dishonest. :( Thank you thank you for taking the time to do this and sharing it for free with all of us!! I used your calendar last year and this year I looked for it again in November. I printed it and accidentally recycled the second page. Today when I came back on to print it again and noticed your notice, my heart broke. I am so sorry. You are doing great work! Thank you!